4 Bedroom Semi Detached House For Sale in Nottingham for Asking Price £170,000. 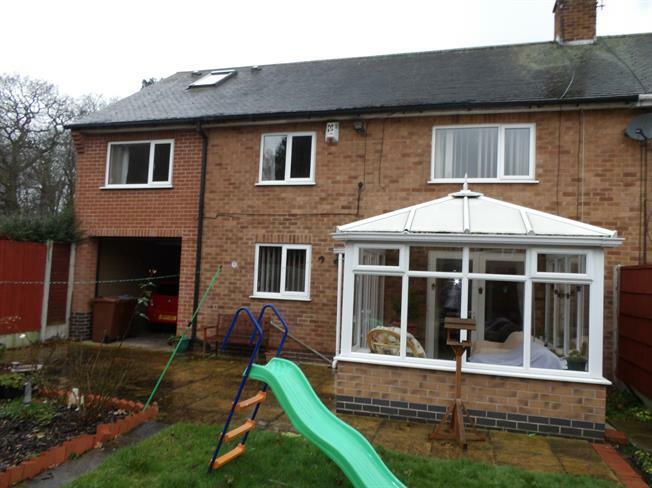 Four bedroom semi detached house which has extensive accommodation spread over two floors. The property has the benefit of two huge loft spaces which offer the flexibility to be converted into further rooms. The accommodation comprises entrance porch, entrance hall, lounge, dining room, conservatory, fitted breakfast kitchen, stairs to landing, four bedrooms, bathroom, shower room, pull down ladders to two loft spaces (one has been floored with velux window to the rear. VIEWING A MUST!!! UPVC front double glazed door. Radiator, carpeted flooring, built-in storage cupboard, stairs to landing. UPVC French double glazed door. Radiator and electric fire, carpeted flooring, original coving. French double glazed door. Tiled flooring. UPVC side double glazed door. Double glazed uPVC window facing the rear. Radiator, tiled flooring, part tiled walls. Roll edge work surface, wall, base and drawer units, one and a half bowl sink, electric oven, electric hob, over hob extractor, space for washing machine. Double bedroom; double glazed uPVC window facing the rear. Radiator, carpeted flooring, a built-in wardrobe. Double bedroom; double glazed uPVC window facing the front. Radiator, carpeted flooring, original coving. Double bedroom; double aspect double glazed uPVC windows facing the front and rear. Radiator, carpeted flooring. Single bedroom; double glazed uPVC window facing the front. Radiator, carpeted flooring, a built-in wardrobe, pull down ladder leading to a useful loft storage room. Double glazed uPVC window facing the front. Radiator, tiled walls. Low level WC, panelled bath with mixer tap, walk-in shower, pedestal sink with mixer tap. Double glazed uPVC window with obscure glass facing the front. Radiator, built-in storage cupboard, tiled walls. Low level WC, walk-in shower, pedestal sink. Velux window facing the rear, Door to a second loft room which needs to be boarded.